First of all, thanks so much for purchased our item. We’re really appreciated it and hope you enjoy it! Now that you've downloaded our theme and here is how to install it. 1. FTP Upload. Unzip the download and upload the theme into /your WordPress themes directory /wp-content/themes. 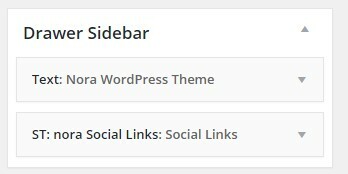 Now, activate the theme by going to Appearance -> Themes in the wordpress dashboard. 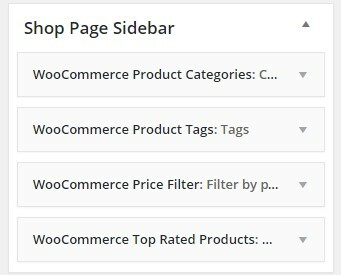 If you use and actived WooCommerce plugin, you should skip setup WooCommerce page. 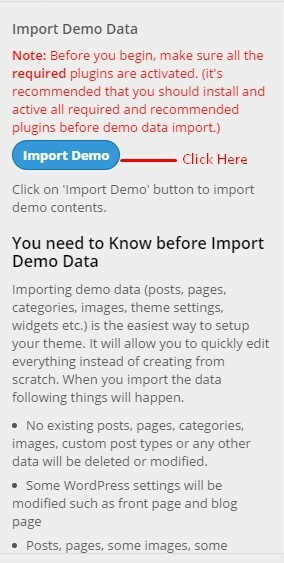 After that, all you need to do is go to Appearance > Customizer and click to Import Demo Data and click blue button labeled "Import Demo"
Importing can take a couple of minutes depending on your host, you should see a sucess confirmation when the importing is completed. NOTE: In order to get WooCommerce page working, you will need to go to WooCommerce > Settings > Products, Checkout, Accounts to select WooCommerce template from imported page. ( See the import demo data video for more detail ). That's all, your site now look exactly as our demo and ready to use. The theme offer two Menu locations, one for Header Menu and another for Footer Menu. Add your custom menu, drag any link/page/post ... to it and set menu location for it. if you want add more social media list with icon then add class name and provide css for it. 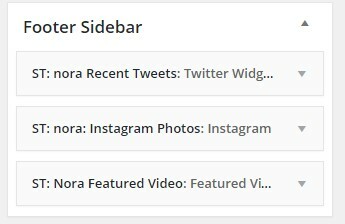 How to display Header topbar? If you want to use site title as logo, then "Tick" checkbox labeled "check this box if you would like to use a plain text logo"
In order to change Theme style such as background, text color, link colors ... go to Appearance > Customize > Style Settings > Styles. From there you can change style for your Theme. This theme come's with 2 slider types, one is post thumbnail slider with title and excerpt and next is portfolio thumbnail slider with title and excerpt. 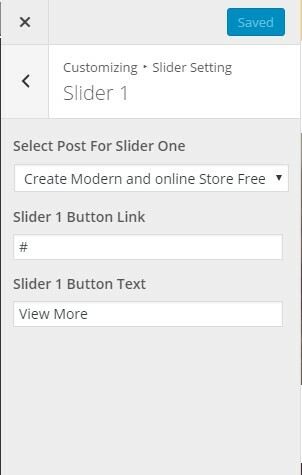 You can add slider to blog home page and shop home page. 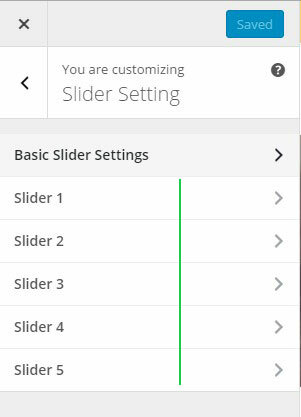 To add slider please follow following steps. a. slider Post Form Post Type: check this radio button if you want post thumbnail to use in slider. b. Slider Post Form Portfolio: check this radio button if you want portfolio thumbnail to use in slider. 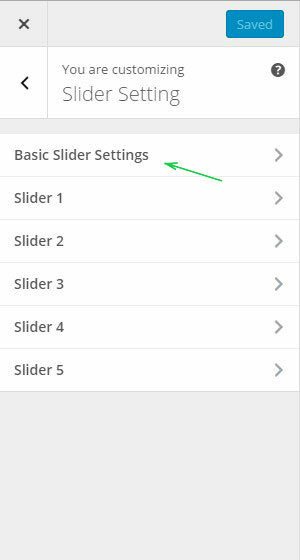 4. if you choose Slider Post from Post Type, then navigate one step back and choose post for slider in each slider position. 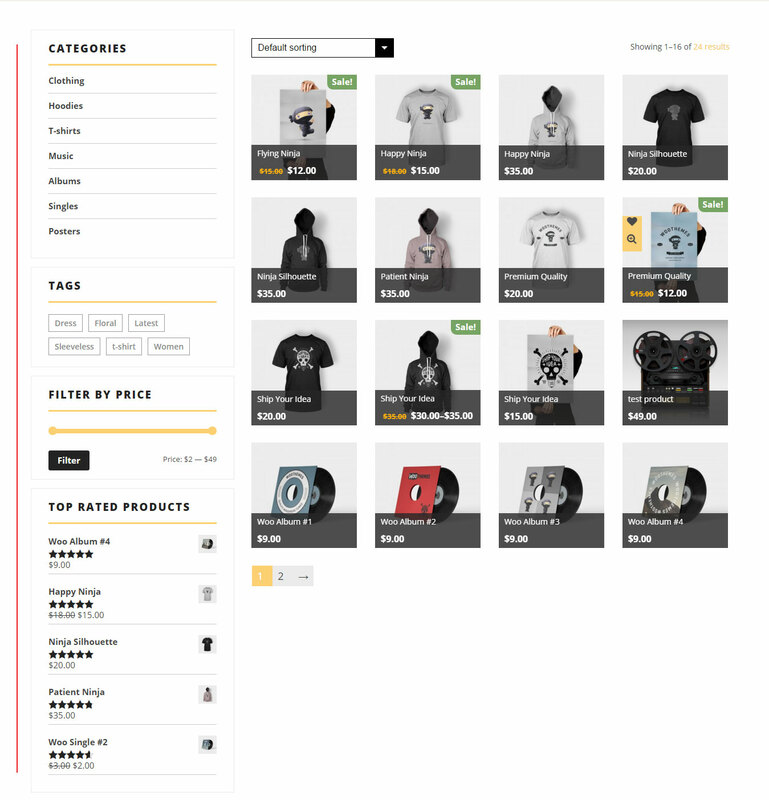 You can apply page template to specific pages to change the look and feel of a page. We have optimized this theme with H1, H2, H3, H4, H5 tags, clean codes and HTML 5. But it still may not be enough for search engines! In such case, you may have to use SEO plugins and Google Pagespeed Service if you want to rank higher with search. Our themes contains a language file with the file ending .pot ( in theme-name/languages/theme-name.pot ) which you can use to translate the theme. The .pot file is basically a list of all the text lines used in the theme files in English language. The easiest way to translate your theme locally is by using the Codestyling Localization plugin. After you have installed and activated the plugin, simply go to Tools > Localization (shown in your language) and translate the theme from your WordPress backend following the plugin instructions. Poedit is a common program which you can use to translate the theme. It’s available for free on poedit.net. After you have installed Poedit, you can open it and select File > New Catalog from POT file. Then select the .pot file from the theme you wish to translate which you can find in the /includes/lang/ or /languages/ folder of your theme. Then go through every line of text and translate it to your native language. Afterwards you can save the catalog with your language code (for example es_ES.po). Normally Poedit automatically creates the .mo file and saves it, too. The last step you have to do is to upload your created language files to the language folder of your theme using FTP. If you don’t use WordPress in your native language so far, you have to tell WordPress which language to use to activate the theme translation. 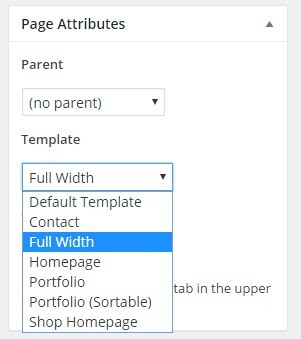 You can do this by editing the wp-config.php file (the file is located in the main directory of your WordPress files) and defining the WPLANG constant. You have to set your language code there, for example fr_FR for French translation.